Engineers are the "unsung heroes" of the Armed Forces, handling a myriad of essential tasks. 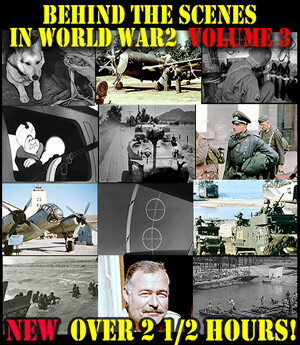 This documentary has World War 2 footage you wont see anywhere else! The first part of the film shows the Army Engineer School at Fort Belvoir, VA. Recruits are given "hands on" training for a wide variety of core skills, including carpentry, demolition, operating heavy equipment, building different kinds of roads and bridges, employing a wide variety of hand tools & more. The second part of the film shows the special challenges faced by Engineers on jungle island campaigns in the Pacific, including clearing jungle tracks, building corduroy roads using palm trees, mining & crushing coral for surfacing roads, carving out jungle air strips, employing steel mats for runways and making good use of indigenous native resources for labor and local knowledge for problem solving. The third part of the film moves to the European Theater of operations & a new set of challenges like building docks, demolishing heavy concrete fortifications, salvaging flooded roads, laying and clearing minefields, constructing lengthy pipelines for fuel transfer and building a variety of bridges including timber trestle, pontoon & steel Bailey Bridges, often under enemy artillery fire And last, but not least, the Engineers picked up there weapons and performed as very effective combat infantry hen necessary, specializing in demolitions & river crossing. Get this video & much more!